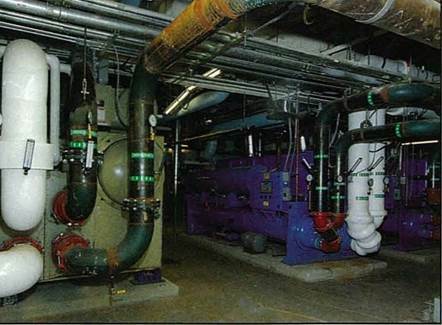 Until recently, the original three 760-ton, electric, centrifugal chillers kept Essex County College’s (ECC) campus buildings cool, but their advanced age resulted in unreliable performance and inefficient operation. In addition, they all utilized R-11, which is both unfriendly to the environment and no longer being produced. A feasibility study performed by EI Associates (EIA) indicated that two of the chillers needed to be replaced as soon as possible. 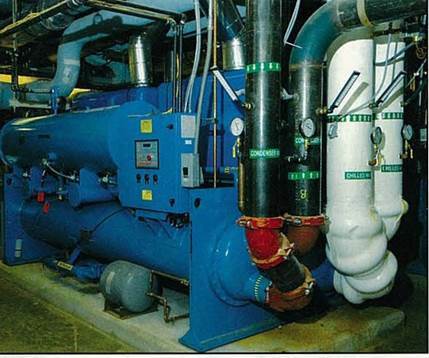 EIA recommended that they replace the electric chillers with gas engine-driven chillers. ECC decided to replace one of the 760-ton electric chillers with one of like kind, and the second electric chiller was replaced with a pair of 400-ton gas chillers. ECC personnel were at first hesitant to embrace the gas engine-driven technology, but they were eventually swayed by the life-cycle costs. It is estimated that gas engine-driven chillers can cut operating costs by as much as 30% to 60% compared with conventional electric chillers. This is mainly due to the fact that they can help a facility avoid electric demand charges and “time-of-day” rates. ECC was happy to see the money being spent on equipment that would save energy costs. Demand rates during the summer “are a killer,” so relying on equipment that utilizes gas, which is cheaper than electricity during the summer, made perfect sense.